Pour the rice krispies in a large mixing bowl and set aside. Melt the butter in a saucepan over low heat. Once they're melted add in the marshmallows. Stir until the marshmallows are mostly all melted (this will take a few minutes--low and slow is key for perfect texture) then stir in the vanilla. Once fully melted, take them off heat and pour over the rice krispy mixture. Stir lightly to combine. If you are going to cut these out into strawberry shapes: I would recommend pressing them into a 9x13 pan so they are thinner. 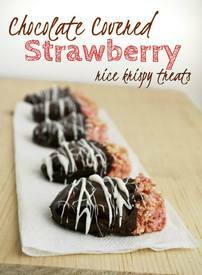 Allow them to cool for about 20 minutes, then cut out your strawberry shapes with a cookie cutter. Eat the remaining odds and ends Dip the "strawberries" into the melted chocolate coating and set on a piece of wax paper to harden. Enjoy! If you are just going to keep them as squares: Press them into a 9x9 pan to get good, thick treats. Let them cool for about 20 min, then pour the chocolate coating on top in a thick layer. Allow to harden and enjoy! **If you can't find the strawberry marshmallows, don't despair! Instead use 5 cups of regular marshmallows, and add in about 3 Tbsp. of dry strawberry jello mix when you add the vanilla. It will give you a similar flavor. Melt chocolate and oil in a microwave safe bowl in 30 second increments, Stirring between each one. Continue until fully melted.